This is something to hear and talk about it but this is something totally different to experience it, it’s thrilling, even on modest scales. Since my LibraryThing application for Facebook is out it has clearly had a viral growth curve. So far there are only 435 users and every week I am looking for an inflection of this tendency. I know there will be one because there is a limited number of LibraryThing users on Facebook. My goal, right now, is to attract as many of them as possible on this application. 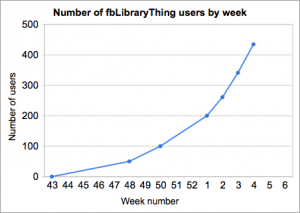 The next step will be to attract Facebook users to LibraryThing. But I know that for this I will need help from Tim Spalding and the LibraryThing team. I have always been grateful for their work but I must admit that I have been quite disappointed recently as I was trying to contact them and they constantly ignored me. I am also thinking about open-sourcing the application, because I think it is both a good use case for people who are developing Python/Django applications on Google AppEngine and those who are developing for the Facebook platform. I still have to choose a license but the GNU Affero General Public License seems like a good match. This entry was posted in Facebook Applications, Freelancing & Networking, Projects & Realizations and tagged books, facebook, librarything, users, viral growth on 2010-01-30 by Claude Vedovini.